Father Thomas Colman Fahey, 99, Huntington, IN, passed away on Sunday, March 17, 2019, at St. Anne Victory Noll in Huntington, IN. Father Fahey was born on December 6, 1919, to James and Norah (Neilan) Fahey in Galway, Ireland. His parents preceded him in death. 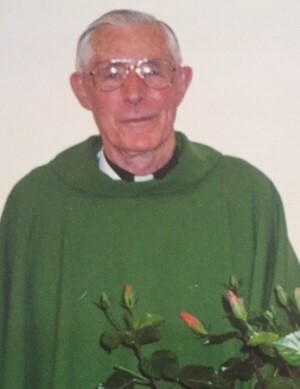 Father Fahey was ordained as a Priest in Carlow, Ireland on June 1, 1947. He began his career at the Diocese of Cheyenne, WY, at St. Mary’s Cathedral from 1947-1948; Holy Name Parish, Sheridan, WY from 1949-1952; St. Laurence O’Toole, Laramie, WY, from 1952-1956; Hospital Chaplain, Cheyenne, WY, from 1956-1968; Iona College, New Rochelle, NY, 1968-1970; St. Mary’s Cathedral, Cheyenne, WY from 1970-1972; Corpus Christi Parish, Newcastle, WY, from 1972-1977; Holy Trinity Parish, Cheyenne, WY from 1977 until his retirement in 1990. In July, 1990, he spent some time in Arizona before he made his final residence and served as Chaplain beginning in August, 1991, at Victory Noll, now known as Saint Anne Communities – Victory Noll, Huntington, IN. Father Fahey is survived by two sisters, Sheila Lynch, Gertrude Fahey; one brother, Jack Fahey; many nephews and nieces and many more relatives who survive and reside in Ireland. Father Fahey is also survived by the Victory Noll Sisters. Along with his parents he was preceded in death by two brothers, J.J. (James Joseph) Fahey, Bertie Fahey; and two sisters, Mary Frances O’Sullivan and Betty Fahey. Calling hours will be from 4:00 p.m. to 6:30 p.m. on Tuesday, March 19, 2019, at Archbishop Noll Memorial Chapel – Saint Anne Communities, 1900 West Park Drive, Huntington, IN. A vigil will be held at 7:00 p.m. on Tuesday, March 19, at Archbishop Noll Memorial Chapel – Saint Anne Communities, 1900 West Park Drive, Huntington, IN. Mass of Christian Burial will be held on Wednesday, March 20, at 10:30 a.m. at Archbishop Noll Memorial Chapel – Saint Anne Communities, 1900 West Park Drive, Huntington, IN, with Rev. Carl A. Beavers, Fr. Maicaal Lobo, Fr. Stephen Colchin, and Fr. David Ruppert presiding. Burial will be in Victory Noll Cemetery, Huntington, IN.